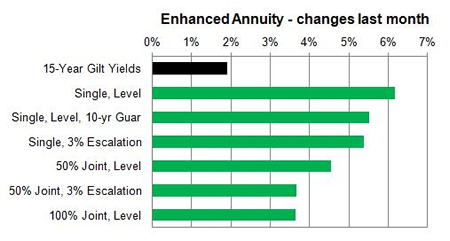 Smoker and enhanced annuities increase by up to 8.0% after yields rise and remain high during the month following the sell off of EU and US bonds. Providers of smoker and enhanced annuities aggressively increase rates by up to 8.0% as the 15-year gilt yields remain high during the month and up 19 basis points for the month. Yields improved after bond markets were hit around the globe as the European Central Bank (ECB) expected the eurozone's recovery to continue. Investors sold bonds lowering the price with the 10-year German Bunds gaining 19 basis points leading the 10-year US Treasury notes rising 10 point gain. The world markets are being driven by Europe after the ECB launched quantitative easing. 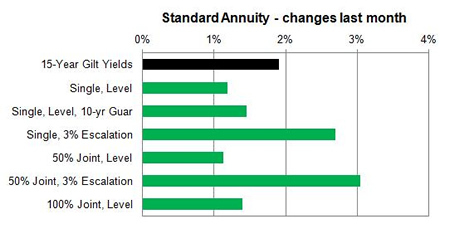 Standard providers were higher by an average of 1.69% and we would expect to see an increase of 0.21% in the short term and in the medium term of 3 months annuity rates will decrease by 0.45% if yields do not improve further. 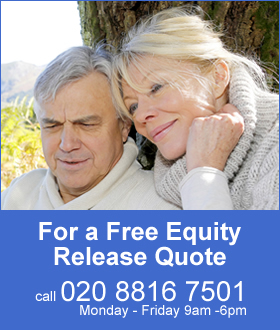 Smoker and enhanced annuity providers increased their rates by 5.21% on average with a decrease of 3.31% possible in the short term and in the medium term of 3 months we can expect a decrease of 3.31%. Equity markets started at 6,984 and increased by 463 points to end at 6,521 after concerns over a Greek default. The majority of rates increased with 98% rising, 0% remaining unchanged and 2% decreasing. Standard annuities increased this month with a strong performance from escalating annuities increasing by up to 4.2% for both single and joint life aged 55 to 70 with a small decrease of 0.5% for those aged 75. For enhanced and smoker rates were significantly higher from 3.8% to as high as 8.0% for single life aged 75 for both level and 3% escalating annuities. For joint life the range of increases was from 2.2% to 5.3%.